Jolie’s doctor had said that her recent insomnia and tearfulness was due to anxiety over a forthcoming test; he had recommended that she came to see me as relaxation skills might help more than drugs. The minute I met Jolie I could see she was great fun and full of life; that was until we started to talk about the reason for her visit. As her eyes welled up with tears she quietly explained the sequence of events that led her seeking help. Two years ago she had taken her accountancy exams and passed all but one paper. So she sat them again and this time failed by one mark. Jolie had put a lot of pressure on herself to pass second time around and felt very anxious about the test. That anxiety reached such a peak in the last exam that she had gone blank and was unable to answer several questions. Subsequently Jolie had not been able to stop thinking about that exam paper and was highly anxious at the thought of the third retake in two months time. She had become reclusive, snappy and obsessed with thoughts about her exams. So what was happening to this normally happy optimistic woman? It is normal to have some anxiety or excitement about being judged. But too much and it sends you into flight and fight, the body’s mode for defence and attack. This is fantastic if you are in an emergency situation and need extra strength and fitness, but not if you are sitting still having worrying thoughts. The chemicals that produce these feelings also upset your stomach, make you want to run from the building and restrict access to your memory. When you worry about an exam it gives a message to the body that the exam and everything to do with it is dangerous. This prepares you to act instinctively and immediately; totally the opposite of what you need for good information recall. Anxiety responses when you see or think about anything related to the test - reference books, the test date, even facts from the test! It may sound simple but all you have to do is to change the way you think about the exam. If you see it as affecting everything that you ever do, that you are no good and that you probably won’t pass, is it a wonder that you feel bad? Don’t cram your learning, make a timetable of preparation. Get the main concepts of what you have to know and then fill in the small details around them. Make sure that your own basic needs are met. Throw away that coffee and make sure that you get plenty of sleep. When is your best time of day for revision? When are you mentally most receptive and alert? If it is a physical skill then when are you at your physical best? Plan to focus on your development at those times. Are you expecting yourself to do brilliantly? Sometimes that can be a pressure that is not helpful. Ask yourself what is a ‘good enough’ outcome. Change what you are saying to yourself by listening to this Test Anxiety self hypnosis session. Many people will have done lots of standard revision for your exam, but you can gain the added benefit of preparing your brain so that recall is effortless and easy. This is known as the state of slow, where the mind becomes quiet and all you experience is total absorption with the task at hand. This can happen if you are well prepared; a golfer who has practiced a particular shot time and time again will be able to repeat that shot under pressure if he is relaxed. If anxious thoughts creep in it stops you accessing this flow state. Self hypnosis helps you to learn how to relax and perform positive mental rehearsal. All great sports men and women do this. Self hypnosis for performance or tests actually creates pathways of neural activity that are activated in the real life situation. What most people do is negative mental rehearsal, pondering for hours everything that will go wrong. Is it any wonder that this generates an uncomfortable experience on the day? You are revising or practicing and are confident and relaxed in the same way. How do you look? What differences do you notice about yourself? 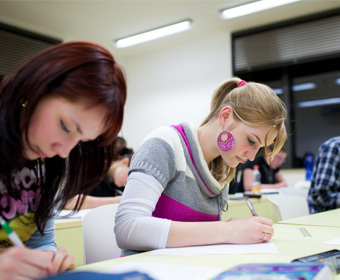 See yourself on the day of the exam looking relaxed - again what are the differences when you are feeling good? How do you sit, walk, smile when confident? Take yourself from when you get up in the morning to visualising yourself coming out of the exam feeling pleased with your efforts. What reward will you give yourself? Jolie decided that she was going to meet her husband and go for a glass of champagne in a posh hotel. Jolie put lots of effort in to changing the stuck record of thoughts that used to play in her head. She enlisted the help from an accountant friend of hers who helped go over past papers every other Saturday. She got up an hour earlier three days a week and did a little before she got the kids up. That was her best time to learn. She started to play tennis and see friends again. She practiced self hypnosis almost every day. Jolie visualised herself at work and how she effortlessly completed jobs and answered questions that others found difficult. Then she imagined having that state of mind each time she came to do the revision and during the whole day of the test too. And did Jolie pass? Yes she did. She had replaced her test anxiety with feelings of looking forward to the day of the test and rehearsed feeling relaxed in the exam itself. She even bought a new outfit for the occasion to help make herself feel good. Congratulations to you Jolie! Now it is your turn.